I got this recipe from my aunt. Not only do the muffins taste just incredibly awesome, you can just bake up what you need and save the rest of the batter in your refrigerator for up to 5 weeks! 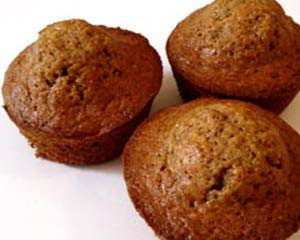 :) It makes a lot, and if you're obsessed with bran muffins like I am, you'll be in heaven for about a month! Of course you can always cut the recipe in half, or just make your muffins a bit bigger if you'd like. I'm in love. add 1 qt. buttermilk, 5 cups of flour, 5 tsp. baking soda, 4 more cups of bran to the 4 ingredients above that have been creamed together. Mix well. Add the bran/water mixture that had been set aside to the batter. Mix well. Bake at 400 degrees for 15 minutes or until toothpick comes out clean. Batter can be stored for up to 5 weeks! In a medium bowl, beat together peanut butter, cream cheese and sugar. Fold in about half of the whipped topping. Spoon mixture into pie shell, spreading evenly. Reserve 2 tbsp. of hot fudge topping. Place the remaining hot fudge in a microwave-safe bowl or large glass measuring cup. Microwave for 40 to 60 seconds till slightly warmed. Stir. 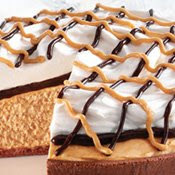 Spread fudge topping over pie to cover the peanut butter layer. Refrigerate until serving time. Just before serving, drop dollops of the remaining whipped topping over the hot fudge layer; spread out, being careful not to mix the two layers. Place the reserved fudge topping in a small plastic bag and knead for a few seconds to warm it. Cut a tiny hole in the corner of the bag; drizzle over the pie. Do the same thing with the remaining peanut butter to garnish. An oldie, but a goodie. All about the comfort food around here. Nothing better than a ton of noodles smothered in melted Velveeta cheese. Ya know? We cut this recipe in half because there's only the 2 of us. We still had left-overs. Cook noodles according to package directions; drain. Meanwhile, in a Dutch oven, melt butter. Stir in the flour, garlic salt and onion salt until smooth; gradually stir in milk. Bring to a boil; cook and stir for 2 minutes or until thickened. Add the cheese; stir until melted. Stir in the noodles. Transfer to two greased shallow 2-qt. baking dishes. 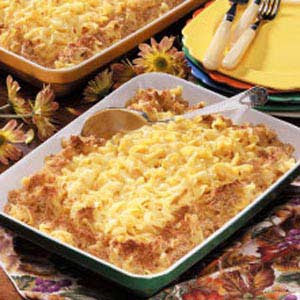 Combine bread crumbs and butter until crumbly; sprinkle over casseroles. Bake, uncovered, at 350° for 25-30 minutes or until golden brown. Yield: 2 casseroles (12 servings each). This takes 1/4th the time it takes to make potato salad; maybe even less than that. And it's SOOOO good. When you don't want to fuss with making a huge salad, try this. It's quick. It's fast. It's delish. 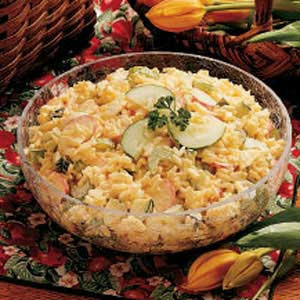 In a large bowl, combine rice, radishes, eggs, cucumber, celery and onion. Combine mayonnaise, mustard and salt; mix well. Pour over rice mixture and toss. Cover and refrigerate at least 1 hour. Yield: 12-14 servings. UPDATE: I used instant brown rice instead of long grain rice and it turned out just fine!